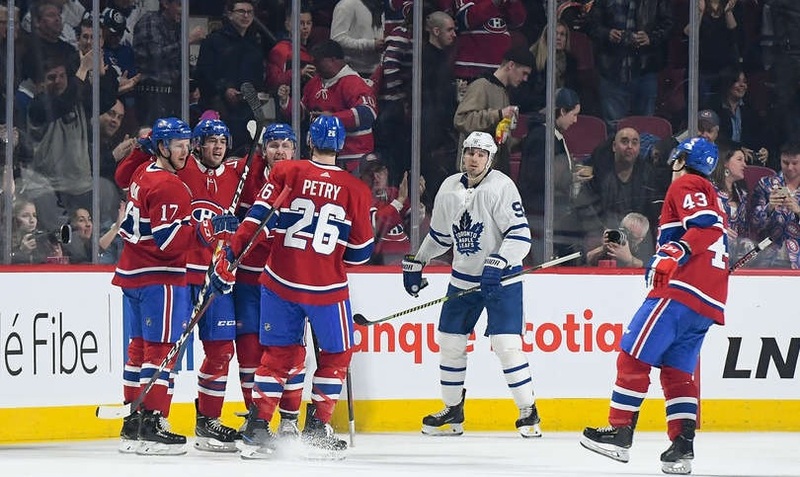 The Habs looked to finish the 2018-19 season on a high note as they hosted Toronto on Saturday night. The game was wild and wacky at times while a newcomer made an immediate impact in a 6-5 shootout victory for Montreal. 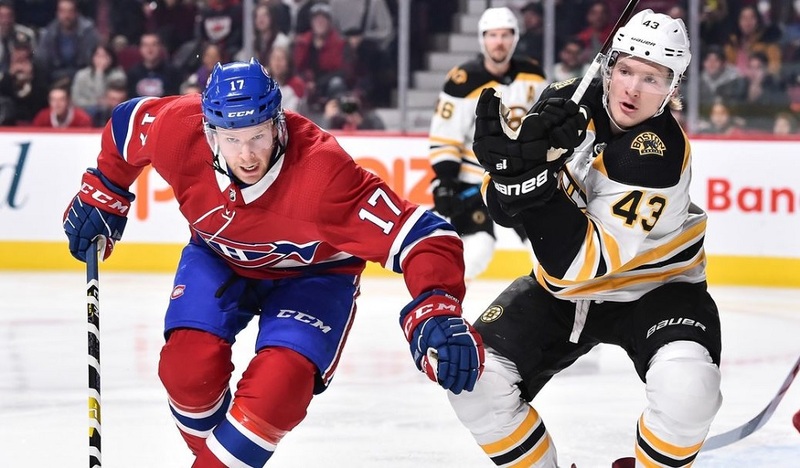 After being eliminated from postseason contention on Friday, there were a handful of lineup changes for the Canadiens in this one. Charlie Lindgren made his first start of the season (and first start period since March 9th in Laval), giving Carey Price the well-deserved night off. Paul Byron is dealing with a wrist injury so he sat in place of Nicolas Deslauriers while Ryan Poehling got the nod to make his NHL debut with Nate Thompson ceding his spot to the rookie. Poehling made an early impact as he had a good shot on his first shift which was the highlight of the first few minutes. Toronto didn’t waste much time getting on the board though. Just before the six-minute mark, Zach Hyman got the puck behind the net, came out and spun around while being watched by Victor Mete, and then threw a weak shot towards the net. The puck hit Shea Weber’s skate and directed by Lindgren. The Habs got a good scoring chance a minute after that as Tomas Tatar was left uncovered in the slot. The pass came through but he missed the net. That proved costly as Toronto came back the other way and made them pay. A slow Jake Gardiner point shot wound up being redirected along the way, changing the angle just enough to fool Lindgren to make it 2-0. A couple of minutes later, Jesperi Kotkaniemi had a strong chance off a good centring feed from Joel Armia but Frederik Andersen made the stop. The Leafs came back the other way with Lindgren making a nice sliding stop on Patrick Marleau just before the halfway mark of the period. After Toronto got a good bounce on the first goal, Montreal had one go their way as well. Jordan Weal had the puck behind the net and threw it towards Ryan Poehling who was driving the net. Poehling didn’t have time to really do anything with it but it hit him and trickled through Andersen for his first NHL goal. He was far from done there. After that, the final stages of the opening period went by fairly quietly. Lindgren made a few routine stops look anything but that but the two teams headed to the room with Toronto up by one. Shots on goal in the period were 18-14 for the Maple Leafs. The second period was full of action from start to finish. Jonathan Drouin was stopped in close on his first shift of the frame. A minute and a half later, Nicolas Deslauriers got the puck to Jeff Petry at the point. His shot redirected off Frederik Gauthier and off the post. The rebound bounced right to Poehling’s stick, giving him a wide-open net for his second of the night. Four minutes later, Jake Gardiner tripped up Andrew Shaw, sending the Habs to their first power play of the night. It was a very short one as six seconds into the man advantage, Phillip Danault found a streaking Weal who had a tap-in to give Montreal their first lead of the game. That lead didn’t last long. Less than two minutes after Weal’s goal, Trevor Moore got by Petry, giving him a partial breakaway. He skated in and lifted one past Lindgren to tie it up. Less than a minute later, Weber pinched in offensively and had the puck behind the net. He tried a wraparound (and had Andersen beat) but he couldn’t get it to go. Toronto wound up coming back the other way with speed. With Weber not quite back to his position, Hyman was able to get a step on him, giving him an open lane to the net. Mitch Marner’s pass got through but Lindgren came up with the big stop. Shortly after that, Montreal restored their lead. Artturi Lehkonen got the puck behind the net. He set up Max Domi who quickly sent it to Andrew Shaw. Andersen was down and out after the perfect tic-tac-toe play. Less than a minute later, Lindgren made a big glove stop on Auston Matthews on a delayed penalty call on Jesperi Kotkaniemi. Toronto’s power play didn’t get a whole lot going but Lindgren made a couple of decent saves. The Habs weren’t able to get to the room with the lead, however. With less than three minutes left, Lindgren overcommitted as William Nylander took the puck behind the net. That gave the winger ample time to complete the wraparound and beat Lindgren to tie the game. Even the final minute had its chances. Petry broke his stick on a shot attempt with 30 seconds left, sending in Hyman all alone on a breakaway. He tried to go five-hole but Lindgren squeezed the pads to make the stop. Shaw had a chance in tight on Andersen with three seconds left but couldn’t get it past him to keep it tied at the buzzer. Toronto held a 19-17 shot advantage in what was a wild middle frame. It’s safe to say that both coaches pleaded with their teams to play a more responsible third period as the chances were much less frequent. The Leafs had the best chance early on as they came in on a three-on-one. Marner opted to hold the puck and never really got much of a shot off. 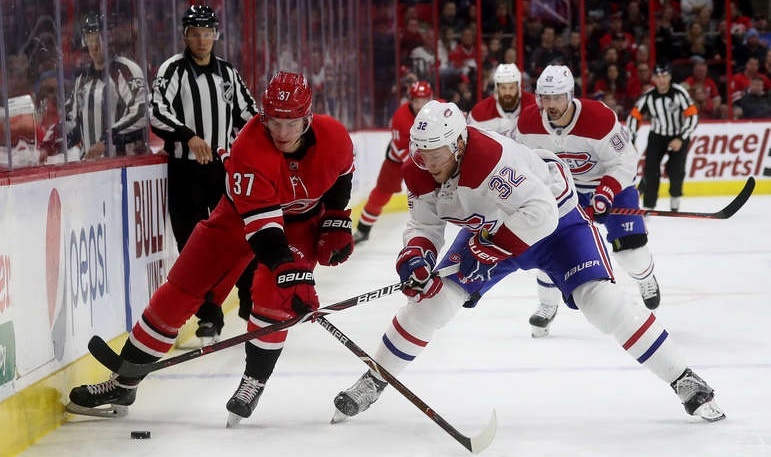 While Montreal’s in-zone coverage was better overall in the third than it was earlier, they did have one big slip up and it proved costly. Kasperi Kapanen was left all alone at the eight-minute mark. Matthews got the pass through and Kapanen made no mistake to give Toronto the lead. Chances were few and far between for Montreal over the next several minutes despite the shot total continuing to grow. Tatar had the best one after a point shot got through but he whiffed with Andersen out of position. However, with less than three minutes left, they capitalized on one of the rare chances they had in the final frame. Shaw made a perfect touch pass to Lehkonen to send him in two-on-one with Poehling (who started the shift on that line for some reason). Poehling’s magical night continued as he beat Andersen for the hat trick. Seconds after the goal, Lehkonen rang one off the post and as the Maple Leafs came the other way, Lindgren made a solid stop on Nazem Kadri to send the game to overtime. The shots were 16-8 for the Habs in the period. In the extra frame, both teams had good zone time early on but weren’t able to do much with it. Things picked up as time progressed though. Lindgren was shaken up after Weal was bumped into him. Brendan Gallagher made a strong sliding play to break up a Toronto chance which ultimately allowed Victor Mete to get a chance to snap his goalless drought but alas, it was not meant to be. It wasn’t his night. It was Poehling’s. After neither team could score in OT (Toronto had the 4-2 shot advantage), Matthews and Drouin traded goals in the first three rounds while Weal rang one off the post. Claude Julien gave Poehling a shot in the fourth round and his big night continued as he scored to give the Habs the lead. Kapanen tried a change-up shot on Lindgren and while the netminder was fooled, he got enough of the shot to make the stop to give the Habs the win. Both netminders turned aside 44 of 49 shots while the Habs surprisingly won the special teams battle as they scored on their lone power play opportunity to crack the 13% mark for the season while Toronto didn’t light the lamp on their chance. 1st Star: Ryan Poehling – For someone who didn’t have a lot of practice time with the team and didn’t get a lot of playing time in this one (he played the least of anyone on the Habs), he made quite the impact. Getting a goal in an NHL debut is impressive, two is very good, and three is exceptional. He’s the sixth player in league history to get a hat trick in his NHL debut. And, of course, he potted the shootout winner for good measure. His first goal may not be one for the ages but his overall game certainly was. 2nd Star: Andrew Shaw – He had gone quiet as of late but he certainly ended his season on a high note. His touch pass really helped set up Poehling’s third goal even though it was only the secondary assist and he was one of Montreal’s more aggressive players overall. A solid finish to his season. 3rd Star: Jordan Weal – Think back to six weeks ago when Claude Julien didn’t seem to want to put him in the lineup and preferred playing Dale Weise instead. That seems almost laughable now with the way Weal has played since getting his chance. He finished up with a bang in this one and even if he doesn’t wind up re-signing with Montreal, he has certainly bolstered his free agent value. Honourable Mention: Nicolas Deslauriers – The fourth line was really good in this one so it’s no surprise all three of them wind up here. Deslauriers actually showed some offensive skill, something that doesn’t happen too often and he looked quite comfortable with Poehling and Weal despite not playing with them at all during the season. The fact he was in the lineup was certainly debatable given that Matthew Peca or Charles Hudon made more sense from a matchup perspective but Deslauriers rewarded Julien’s hunch with a solid performance.